The Star produced their best performance for weeks against a very good Bo’ness team. Star started brightly and when Lee Currie found David Morris on the left after four minutes, his driven cross was touched goalwards by Errol Douglas producing the first of many saves on the day from Murphy at the expense of a corner. A searching ball from Currie then almost released Kyle Lander who just failed to connect with the through ball after 16 minutes before a dangerous Currie free kick was punched away under pressure by Murphy after 18. 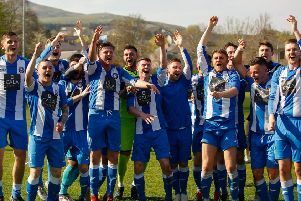 Bo’ness should have scored in 21 minutes when a Will Snowden header flew over the bar from eight yards when he should have scored. The visitors created a good opening after 29 minutes when Simpson swung in a dangerous ball into the Star penalty area but Gemmell and Keast got in each other’s way and the chance was lost. Star created another opportunity after 35 minutes when Morris was thwarted again by a brilliant stop from Murphy. Amos was in action again in stoppage time diving to his left to parry a Philip free kick. The Star started the second half on the front foot and on 49 minutes they were given a golden opportunity to open the scoring from the penalty spot. Errol Douglas stepped up but was unable to beat Murphy who managed to get the ball over the bar. The visitors were still dangerous on the counter and Philip was only inches away with a curling effort after being played in by Simpson. Lander next drove forward from the halfway line after 60 minutes but under pressure was just unable to get enough power in his effort to trouble Murphy. On 74 minutes, Star’s Douglas hit a shot from point blank range but the keeper blocked the effort and the ball was scrambled to safety. Newtongrange: Amos, Swaney (Cook), Hamilton, Murray, Martynuik, Currie, Wilson, Morris, O’Brien, Douglas, Lander. Subs: Cropley, Lally, Flynn, Bracks.